Early morning sky on Saturday August 29 looking east as seen from Adelaide at 6:30 ACST showing Mars and Venus just above the horizon. Similar views will be seen elsewhere in Australia at the equivalent local time. (click to embiggen). Here we are again! The Mars hoax is circulating once more. No, Mars will not be as big as the full Moon, there will be no double Moon in the sky. In fact, Mars is far from opposition and is quite small (it won't be at opposition again until 22 May, 2016 nearly 8 months). 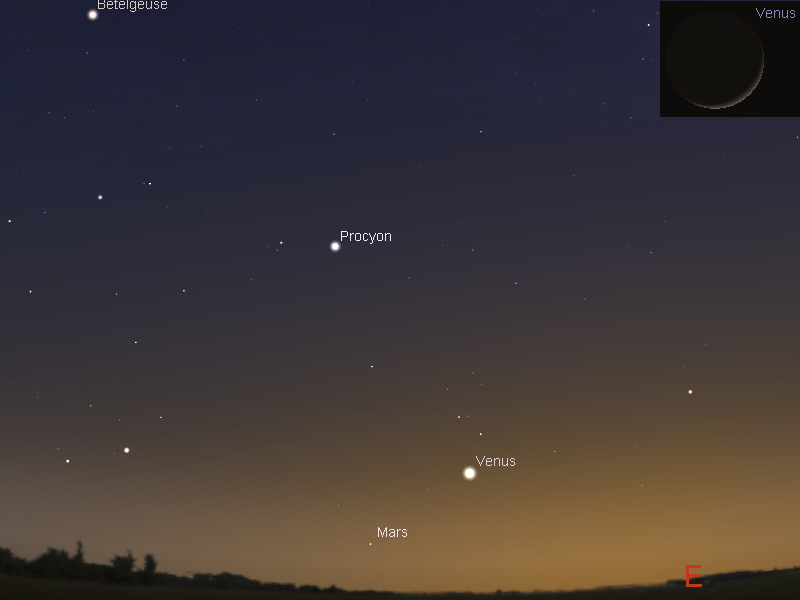 However, on August 27, in the early morning Mars, Venus and Procyon form a nice triangle although Mars will be very difficult to see in the twilight (the image above is at 6:30 am ACST, as seen from Adelaide). # posted by Ian Musgrave @ 11:05 p.m. The Full Moon is Sunday August 30. Jupiter is lost in the twilight. Mercury rises higher in the evening twilight. Saturn is near the head of the Scorpion. Mars is visible low in the morning twilight. 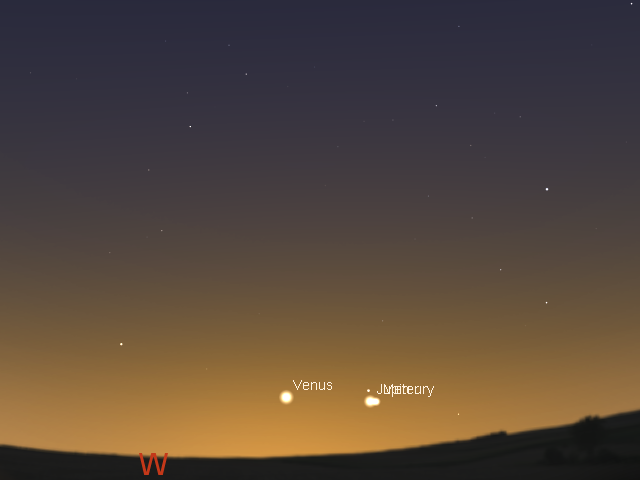 Venus climbs higher in the morning twilight. The Full Moon is Sunday August 30. The Moon is at perigee, when it is closest to Earth, on the 31st. 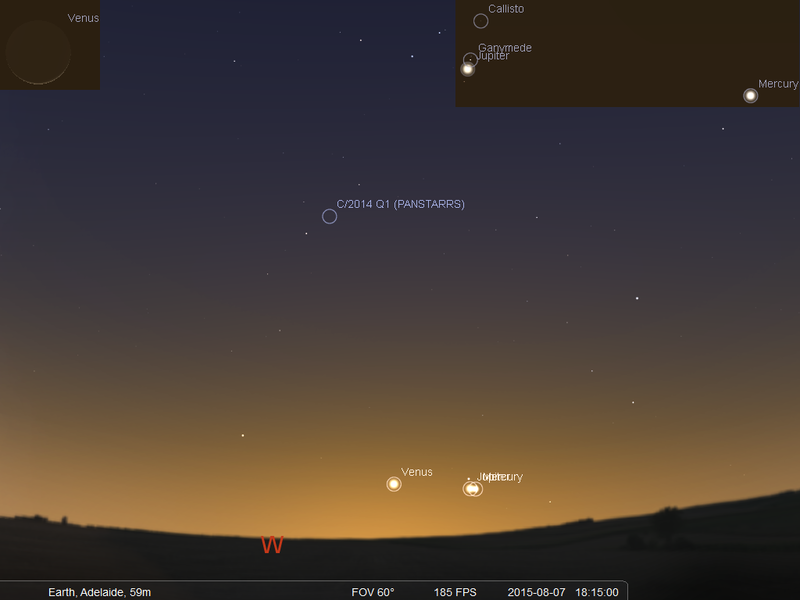 Early evening sky on Saturday August 29 looking north-west as seen from Adelaide at 18:30 ACST showing Mercury. Mercury climbs higher into the evening sky, becoming readily visible. The next few weeks will be the best time to watch this fleeting world as it rises into darker skies. Evening sky on Saturday August 29 looking west as seen from Adelaide at 22:00 ACST. Saturn is easily visible high above the western horizon near the head of the Scorpion. The inset shows the telescopic view of Saturn at this time. Similar views will be seen elsewhere in Australia at the equivalent local time. (click to embiggen). 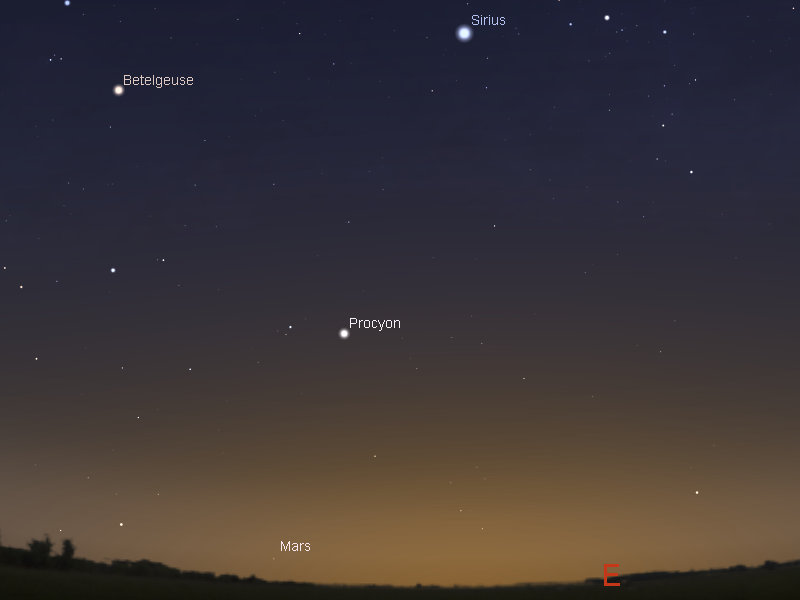 Mars is low the morning skies this week. While it is climbing out of the twilight it still requires binoculars and a flat unobstructed horizon to see effectively. Venus climbs higher in the morning twilight. It is a thin crescent and impressive in a small telescope.You will need an unobstructed horizon to see it before the approaching dawn swallows it up. The Last Quarter Moon is Sunday August 23. Jupiter is lost in the twilight. 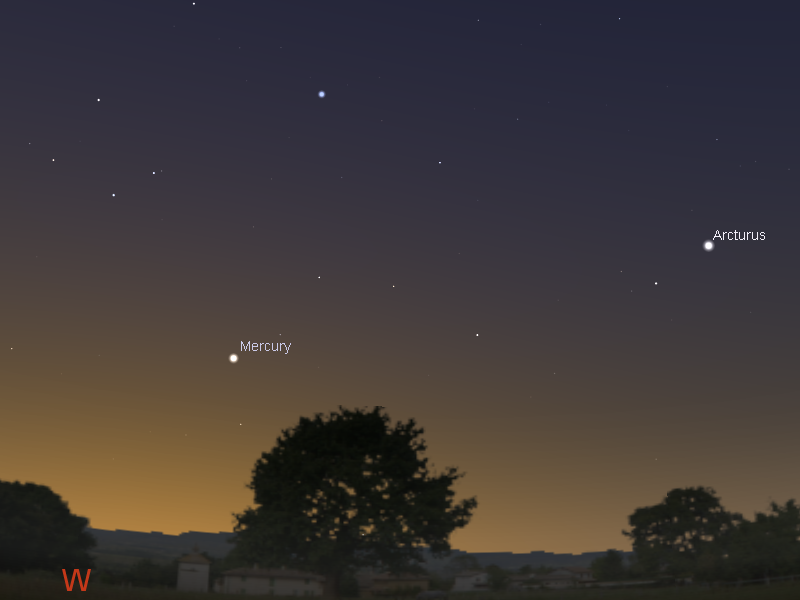 Mercury rises higher in the evening twilight. 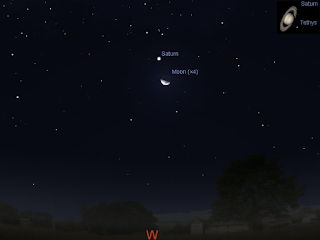 Saturn is near the head of the Scorpion and is visited by the waxing Moon on the 22nd. 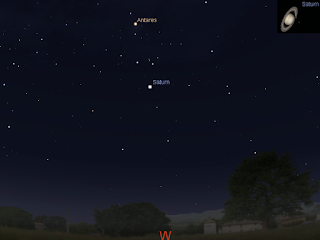 Mars is visible low in the morning twilight and is near the Beehive cluster on the 20th and 21st. 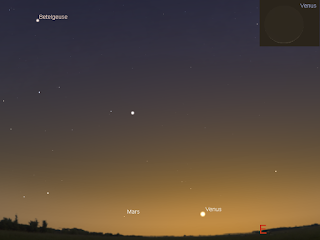 Venus reappears low in the morning twilight near Mars. The Last Quarter Moon is Sunday August 23. Early evening sky on Saturday August 22 looking north-west as seen from Adelaide at 18:30 ACST showing Mercury. Evening sky on Saturday August 22 looking west as seen from Adelaide at 22:00 ACST. Saturn is easily visible high above the western horizon near the head of the Scorpion. The Moon is close to Saturn. The inset shows the telescopic view of Saturn at this time. Similar views will be seen elsewhere in Australia at the equivalent local time. (click to embiggen). While Saturn is readily visible from the end of twilight, it is best for telescope observation from around 19:00 until shortly after midnight. At 18:00 Saturn is at it's highest above the northern horizon near the zenith (with Saturn facing west). 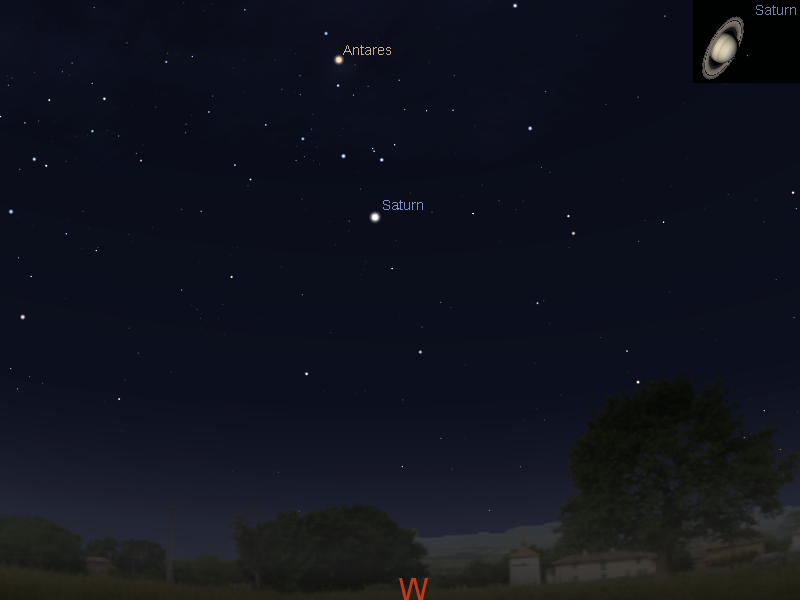 By 22:00 Saturn is high above the western horizon. This is also a good time to scan Scorpius and Sagittarius with binoculars to reveal the clusters in and around the Scorpions tail. Early morning sky on Friday August 21 looking east as seen from Adelaide at 6:15 ACST showing Mars and Venus just above the horizon. Similar views will be seen elsewhere in Australia at the equivalent local time. (click to embiggen). Venus reappears in the morning twilight. It is a very thin crescent.You will need a flat unobstructed horizon to see it before the approaching dawn swallows it up. UPDATE: 7:00 pmConfirmed aurora from Batemans bay and Bicheno Tas just now. Not clear if unaided eye or camera only. Seems to be sporadic, flaring up and dying down. The Australian IPS has just issued an aurora alert for high latitudes BUT despite a good southward magnetic field -8 nT the Launceston Kindex is 5 and the NOAA site a G2 storm current (and a G1 storm predicted later). I leave it up to you folks to decide if it is worthwhile. The storm is unlikely to produce aurora as good as seen last night, which was visible from Southern South Australia and Northern Victoria, with beams "fenceposts" and proton arcs even! Still, Tasmanian and Southern Victoria should be on alert! Aurora are Happening NOW. 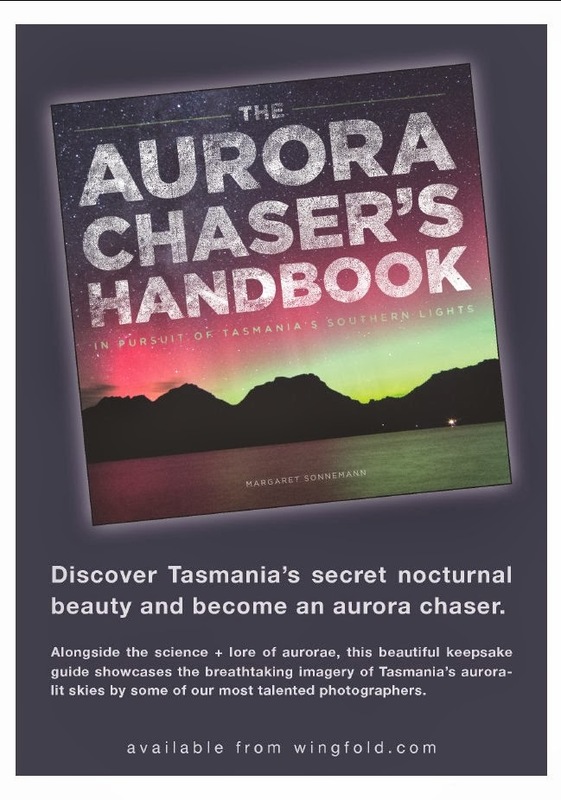 Unaided eye Aurora and beams have been reported in Tasmania, from a wide variety of locations, Inverlock Victoria and some faint camera only colour in South Australia. UPDATE 11:16: Still ongoing Tassie, Bacchus Marsh Victoria and South Australia (south of Port Lincoln). An Aurora Alert and a geomagnetic alert had been issued by the Australian IPS for the 16th due to an anticipated impact from a coronal mass ejection, this activity is possibly due to its early arrival. chance of isolated periods of minor storms at higher latitudes. The New Moon is Saturday August 14. Venus is lost in the twilight. This is the last week to see Jupiter before it disappears below the horizon. Mercury is close to the Moon on the 16th. Saturn is near the head of the Scorpion. Perseid meteor shower 13th-14th. The New Moon is Saturday August 14. The Moon at apogee,(furthest from the Earth) on the 18th. Early evening sky on Sunday August 16 looking north-west as seen from Adelaide at 18:30 ACST showing Mercury and the thin crescent Moon. 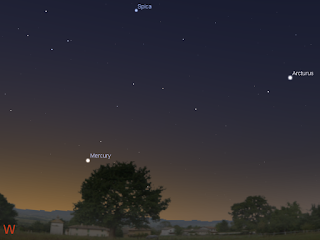 Mercury climbs higher into the evening sky, abandoning Venus and Jupiter. 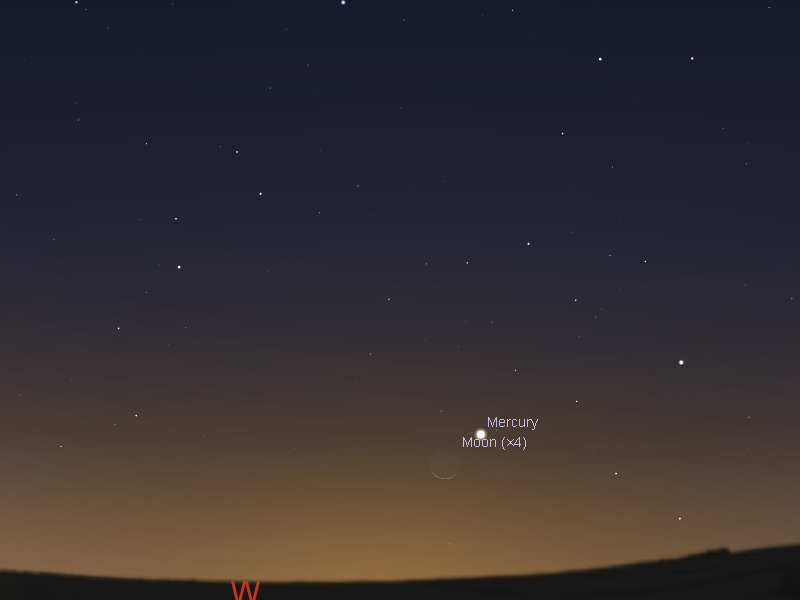 On the 16th, the thin crescent Moon joins Mercury, both will be readily visible in the late twilight sky. You will need a fairly level, unobstructed horizon to see them at their best. Jupiter is also becoming harder to see in the early evening twilight sky and is lost in the twilight by around mid-week. Evening sky on Saturday August 15 looking west as seen from Adelaide at 22:00 ACST. Saturn is easily visible high above the western horizon near the head of the Scorpion. The inset shows the telescopic view of Saturn at this time. Similar views will be seen elsewhere in Australia at the equivalent local time. (click to embiggen). 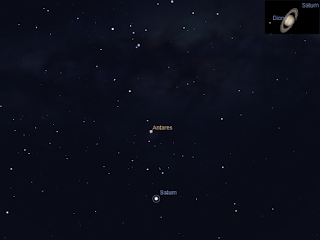 Saturn is easily visible from twilight near the head of the constellation of the Scorpion not far from the bright red star Antares. The sight of the distinctive constellation of the Scorpion curled across the zenith, with bright Saturn close to its head, is very nice indeed. While Saturn is readily visible from the end of twilight, it is best for telescope observation from around 19:00 until shortly after midnight. At 18:30 Saturn is at it's highest above the northern horizon near the zenith (with Saturn facing west). 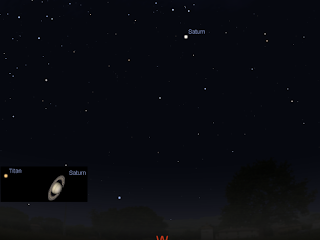 By 22:00 Saturn is high above the western horizon. This is also a good time to scan Scorpius and Sagittarius with binoculars to reveal the clusters in and around the Scorpions tail. Early morning sky on Sunday August 16 looking east as seen from Adelaide at 6:15 ACST showing Mars just above the horizon. Similar views will be seen elsewhere in Australia at the equivalent local time. (click to embiggen). 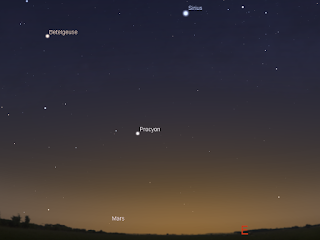 Mars is low the morning skies this week. While it is climbing out of the twilight it still requires binoculars to see effectively. The Perseid Meteor Shower peaks on the morning of Wednesday August 13 between 11am am-midnight AEST (01:30h to 14h on August 13 UT). The best time to observe is on the mornings of the 13th and 14th between 4 am to 5 am AEST when the shower radiant is highest above the horizon. Basically, anywhere south of the latitude of Brisbane (27.3 degrees South) will see few, if any, meteors under ideal conditions. This year, despite having Moonless skies, with the peak occurring during local daylight hours, the chance of anywhere in Australia seeing decent Perseids is low. More detailed viewing instructions are here. Venus (left) Jupiter (bottom right) and Mercury (top right). You will have to click on the image and embiggen it to see them properly. Canon IXUS 400 ASA 0.4 Seconds exposure at around 6:15 pm Close up of Venus (left) Jupiter (bottom right) and Mercury (top right). Canon IXUS 400 ASA 0.4 Seconds exposure 3 x Zoom at around 6:17 pm. Click to embiggen. The weather finally cleared briefly on the 8th so I got a glimpse of Venus, Jupiter and Mercury on the horizon for long enough to get a photo. No chance to get the scope out though to see Venuses ultra thin crescent. The skies had cleared briefly the night before, so I could see Jupiter and Mercury side by side as I was walking home, but I had no chance to image them. Now it is back to our regularly scheduled rain and cloud. 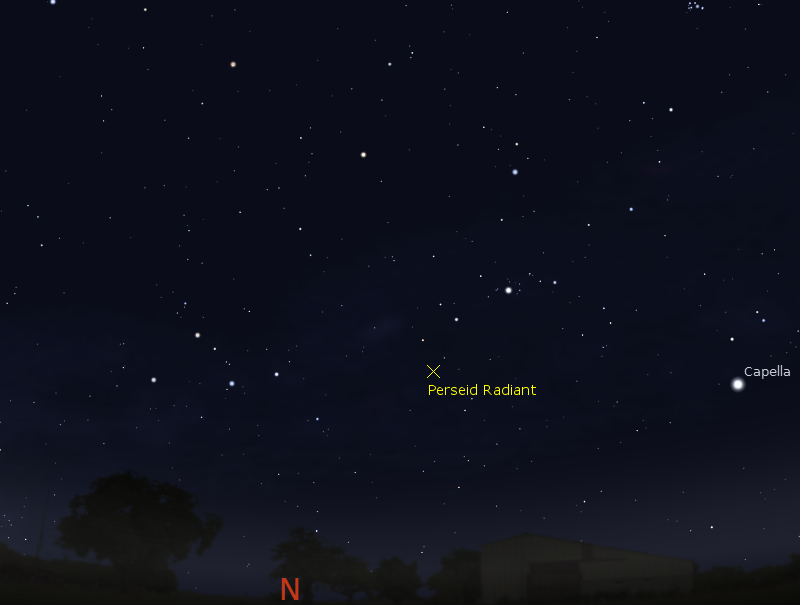 Perseid radiant as seen from Darwin at 5:00 am local time, August the 13th, looking north. 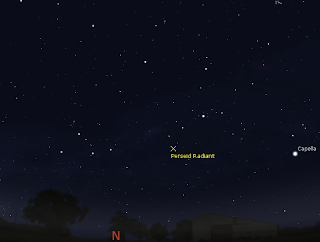 Perseid radiant as seen from Brisbane at 5:00 am local time, August the 13th, looking north. Note how much lower the radiant is. The Perseid Meteor Shower runs from July 17–August 24, and peaks on Wednesday August 13 between 11:30 am- Midnight AEST (01:30h to 14:00h on August 13 UT). See the International Meteor Calendar for 2015 for further details. Despite this being a quite reasonable meteor shower in the northern hemisphere, for most of Australia the radiant is below the horizon, and only the very occasional meteor will be seen shooting up from the northern horizon. This year is not bad, while the peak occurs after sunrise and before the radiant rises (or at least is at its closest to the horizon) in Australia, there is no Moon to ruin the shower. Anyone south of Brisbane will see only the occasional meteor, say maybe one or two per hour (or less), the further north of Brisbane you are, the more meteors you will see. You can check predictions for your local area at the NASA meteor flux estimator (choose 7 Perseids and 12-13 or 13-14 August 2015). People around the latitude of Darwin have the best chance of seeing meteors, possibly as many as one every 3 minutes at the peak (see table below). 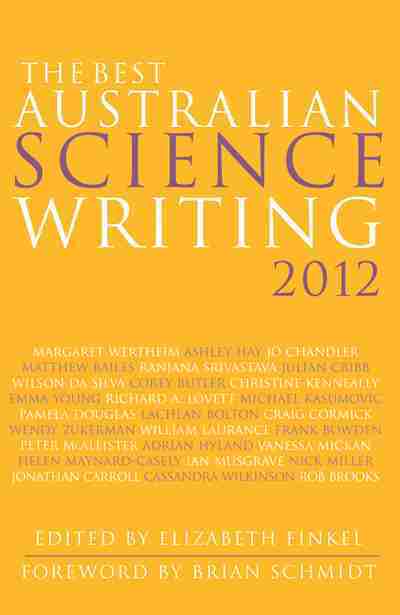 Next is places with the latitude of Cairns, then with the latitude of Mackay (like Port Headland and Mt Isa), and the places with the latitude of Alice Springs (again,see table below). To see the meteors, you will need to be up from around 3:00 am local time on the 12th, 13th or 14th (yes, a really horrible hour of the morning), with best views 4:00 am-5:30 am on the 13th and 14th. 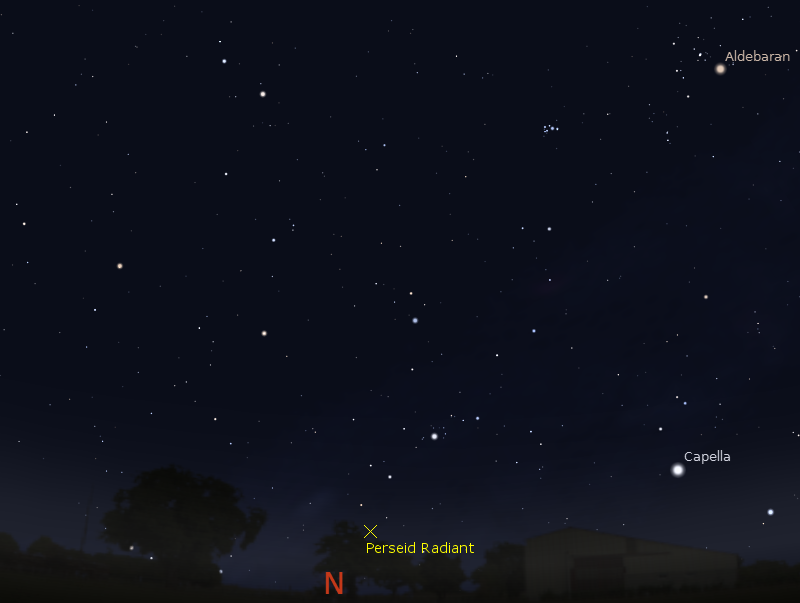 The meteor shower will be located due North, with the radiant just above the northern horizon (see charts above). Cloud cover predictions can be found at SkippySky. The following table show the peak rates at around 5 am local time on the mornings of the 12th, 13 and 14th of August for a number of cities under dark sky conditions. Rates will be similar at the same latitude as these cities, and rates will be intermediate at spots between these cities. Rates on the morning of the 15th are similar to that of the 12th. Note, those of you who have Stellarium, in version 13 they have added meteor shower radiants (rates set in the planets dialogue, F4). However while the radiants show, the simulated meteors come from random points in the sky, not the radiants. The Last Quarter Moon is Friday August 7. Venus is brilliant low in the twilight evening sky with bright Jupiter nearby. This is the last week to see Venus before it disappears below the horizon. Comet C/2014 Q1 PanSTARRS is visible in telescopes. Mercury is very close to Jupiter on the 7th. Saturn is near the head of the Scorpion. Perseid meteor shower 13th-14th. The Last Quarter Moon is Friday August 7. 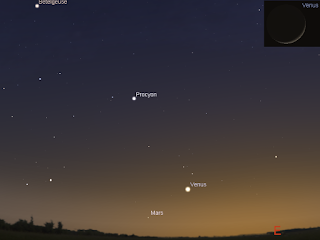 Early evening sky on Friday August 7 looking north-west as seen from Adelaide at 18:15 ACST showing Venus, the star Regulus, Jupiter and Mercury forming a triangle. Comet C/2012 Q1 PanSTARRS is visible in telescopes above. The inset shows the telescope view of Venus and the low power telescope view of Jupiter and Mercury at this time. 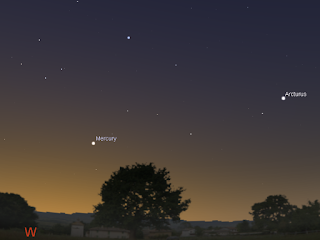 Mercury climbs from the twilight into the evening sky, heading for Jupiter. The pair and Regulus will be less than a finger-width apart on the 7th. At this time Mercury and Jupiter fit into the low power field of a telescope. You will need a fairly level, unobstructed horizon to see them. 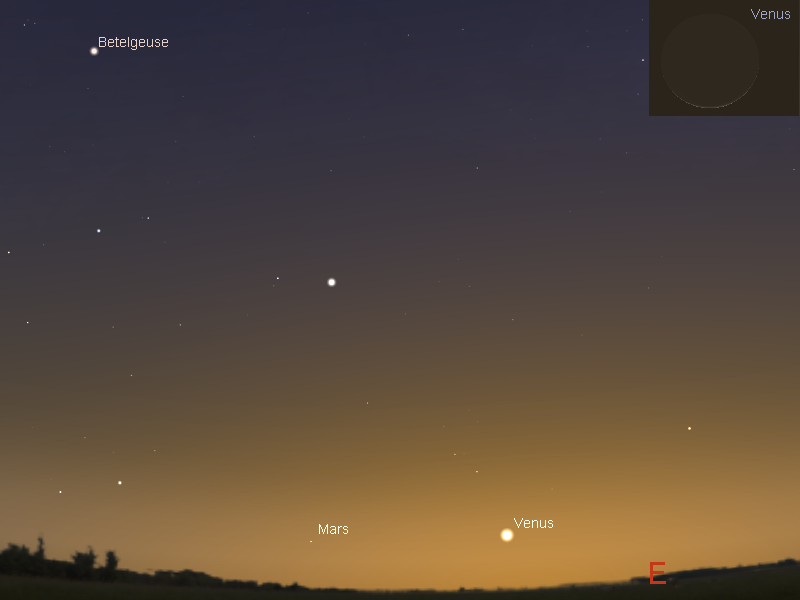 Mars returns to the morning skies this week, but is deep in the twilight and requires binoculars to see. 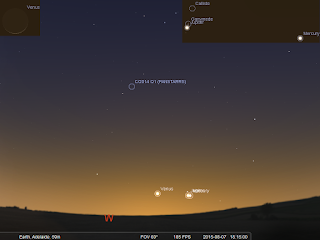 Venus is becoming harder to see above the western horizon in the twilight as it rapidly falls towards the horizon. At civil twilight, half an hour after sunset, it is around a hand-span above the horizon, and is lost in the twilight by the end of the week. Venus is a distinct thin crescent shape in small telescopes and even strong binoculars. The evening sky at 7:00 pm ACST looking west as seen from Adelaide from 6 August to 13 August. 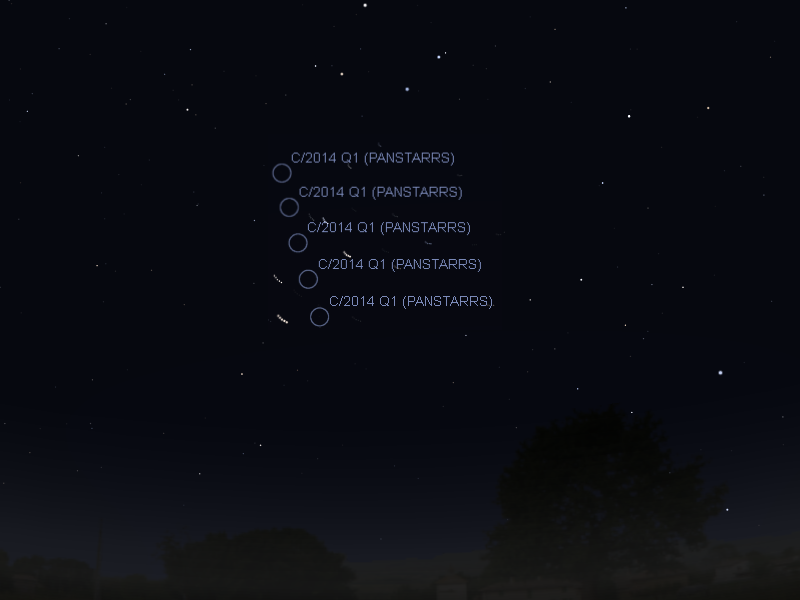 The circles show successive positions of Comet C/2014 Q1 PanSTARRS every two days. Similar views will be seen elsewhere in Australia at equivalent local times. (click on image to embiggen). 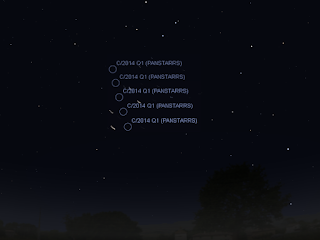 Comet C/2014 Q1 PanSTARRS is now visible in the evening when full dark has fallen. If you try looking an hour and a half after sunset you will see it reasonably high above the horizon. It is only visible in a telescope now. It is now around magnitude 8 and looks like a faint fuzzy ball of light in binoculars. it is now inside the constellation of Crater, the Cup (in the handle). Jupiter is also becoming harder to see in the early evening twilight sky to the right of Venus in the north-western sky. It is also near the bright star Regulus in Leo. Jupiter and Venus move further apart as the week goes on while Jupiter moves closer to Regulus, being closest on the 11th. Mercury, Jupiter and Regulus will be less than a finger-width apart on the 7th. At this time Mercury and Jupiter fit into the low power field of a telescope. You will need a fairly level, unobstructed horizon to see them. Jupiter is no longer high enough for telescopic observation. Jupiter's Moons are still putting on a reasonable display in binoculars before the world is lost in the twilight. Evening sky on Saturday August 8 looking at the zenith while facing west as seen from Adelaide at 22:00 ACST. Saturn is easily visible high above the western horizon near the zenith near the head of the Scorpion. The inset shows the telescopic view of Saturn at this time. Similar views will be seen elsewhere in Australia at the equivalent local time. (click to embiggen). 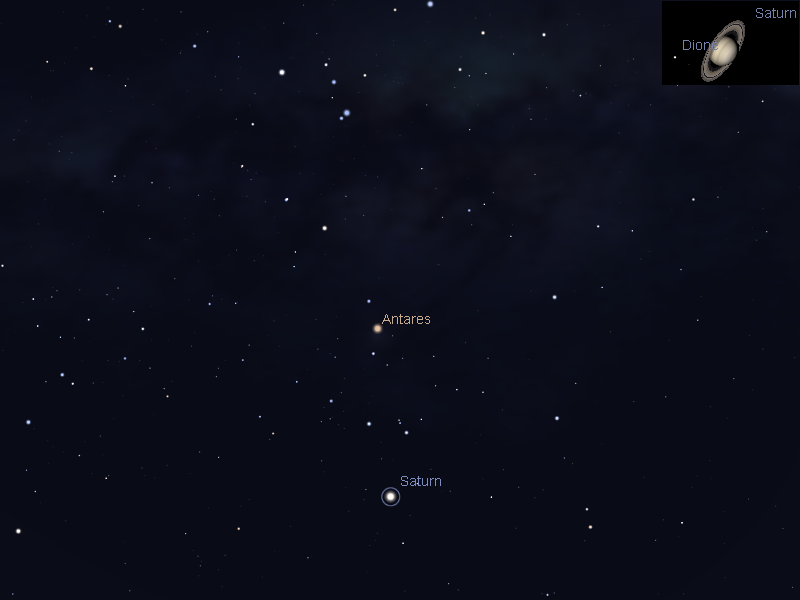 Saturn is now easily visible from twilight near the head of the constellation of the Scorpion not far from the bright red star Antares. The sight of the distinctive constellation of the Scorpion curled across the zenith, with bright Saturn close to its head, is very nice indeed. While Saturn is readily visible from the end of twilight, it is best for telescope observation from around 20:00 into the early morning hours. 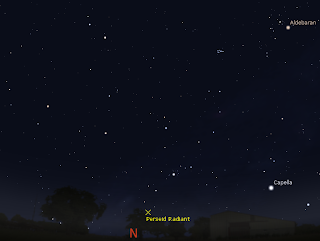 At 20:00 it is at it's highest above the northern horizon near the zenith (with Saturn facing west). 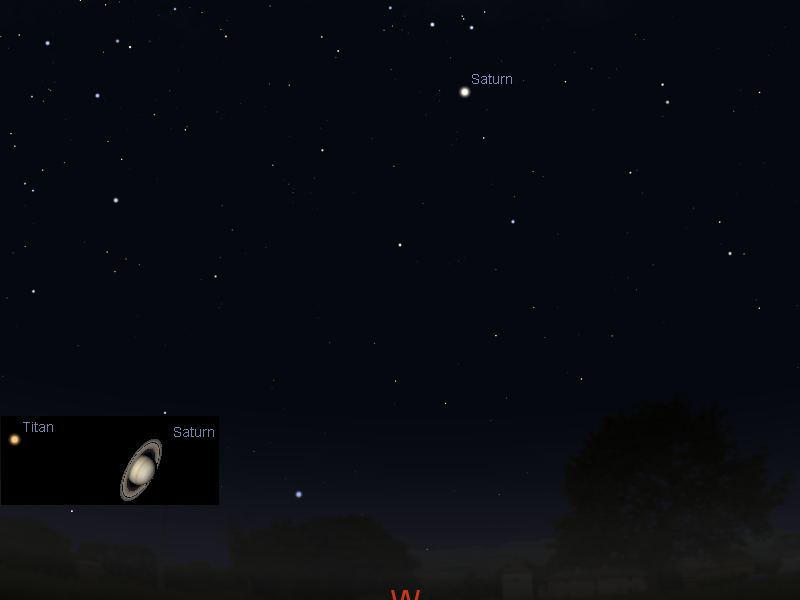 By 22:00 Saturn is high above the western horizon. This is also a good time to scan Scorpius and Sagittarius with binoculars to reveal the clusters in and around the Scorpions tail. 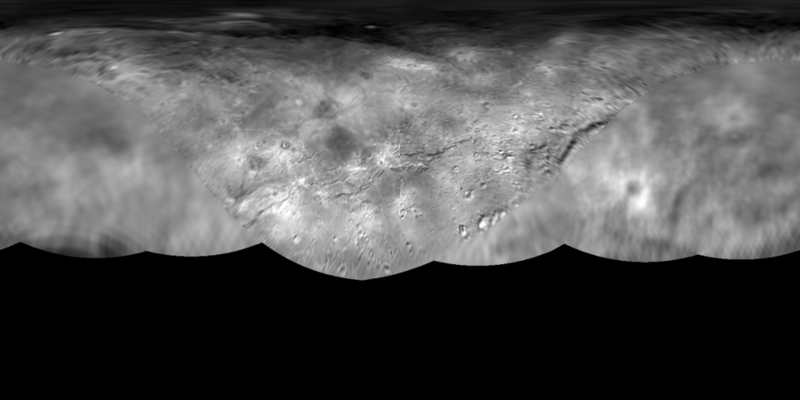 The Charon Global Map has just been released to complement the Pluto Global Map, so I resized it (1024x512) and converted it to a 72 DPI png to use as a texture for Celestia. 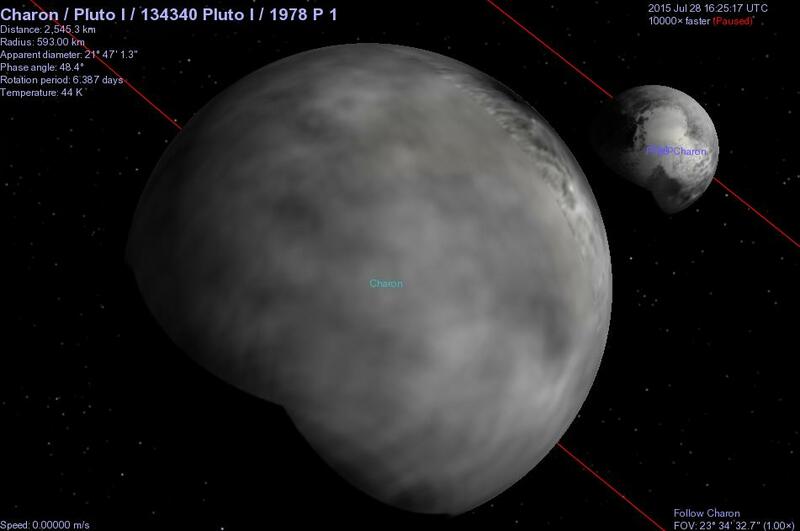 You need to copy the texture file Charon.png to the textures/medres folder in the Celestia directory, then edit the solarsys.ssc file in the data folder (make a backup copy first) to replace the texture name in the Pluto definition section with that of the new texture, save it and you are good to go (just as you did for Pluto). Now I have to learn how to do XYZ or SPICE orbits to add in the New Horizons flyby. And also fix the north polar alignments. Southern Skywatch August 2015 edition is now out! North-western evening sky at 6:15 pm as seen from Adelaide on August 7, Mercury and Jupiter are less than a half a finger-width apart. This month starts with some excellent planetary action with Jupiter meeting Mercury and Mercury the Moon. Jupiter is in the early evening twilight sky in the first half of the month before it disappears into the twilight. It meets swift Mercury on the 7th. Mars is visible low in the morning twilight. 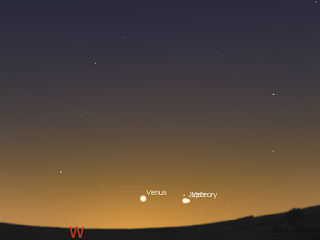 Venus is readily visible in the evening twilight early in the early part of the month. It is visible in even small telescope of good bioculars as a thing crescent. It is lost to sight around the 10th-13th as it comes close to the Su. It re-emerges in the morning sky in late August. Saturn is in Libra. 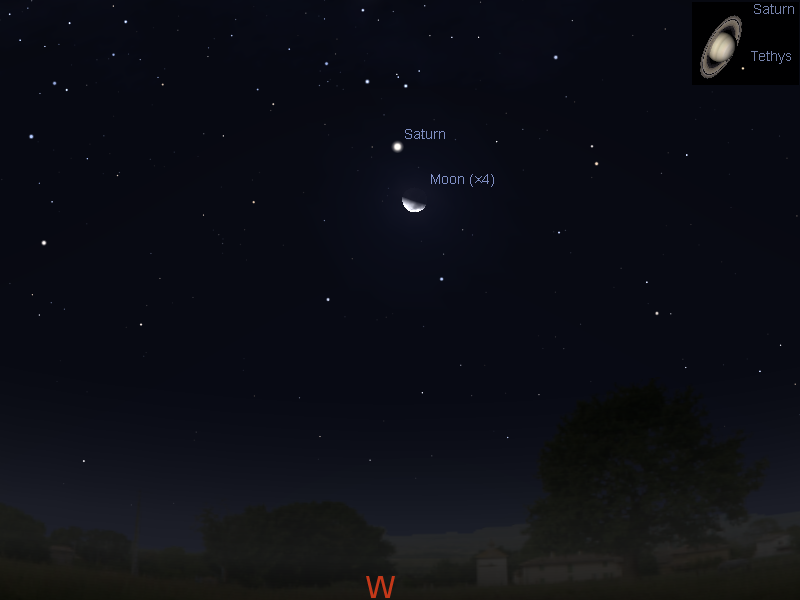 Saturn is close to the waxing Moon on the 22nd. 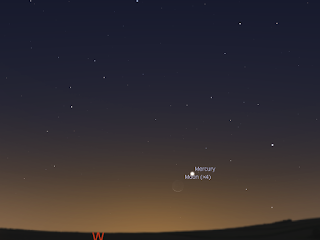 Mercury enters the evening sky it is close to Jupiter on the 7th, and the Moon on the 16th.